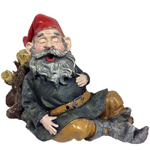 Sneak a sitting gnome into your home with our growing selection at GardenFun. We carry Grimmbel, Zelda, Mordecai, Rumple and Merlin shelf sitters to perch on your bookcases, countertops, fence, or other indoor or outdoor ledge. These adorable gnomes showcase the gnomes’ whimsical and mischievous personalities, like our giggling Zelda and thoughtful Mordecai. Our 13-inch sitters look perfect atop a shelf or on the edge of your garden’s bench, where your best gnome friend will join your afternoons working and relaxing in your yard. Our light-up solar gnome sitters are out of this world. We carry Zelda, Mordecai, Rumple and Merlin light up styles. Each of these gnomes has discreet solar panels and an internal bulb that allows your sitting gnome to illuminate your garden or pathway. 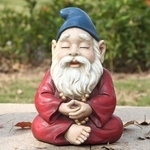 Each solar gnome looks like a regular, solid statue during the day, but will surprise onlookers with a brilliant glow that turns on automatically at night. These solar figures don’t require any batteries or AC power, so simply place outdoors to charge in the sun and enjoy their automatic light. 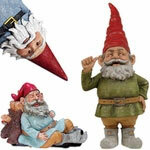 For a set of pint-sized gnomes that you can fit anywhere in your home, try our 6 inch shelf sitter gnomes. This six-gnome set includes your favorite Toad Hollow characters measuring just 6 inches each. Place a few in your garden, others in your home and take one to the office to add a touch of lighthearted fun to your workspace. Our smaller shelf sitters are also a great addition to your garden tiers. 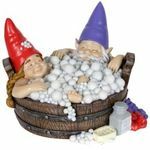 These and all of our GardenFun gnomes are made with a weather-resistant cast stone resin to ensure that your gnomes are looking brand new for years to come. Don’t worry about rain or sun damage. Simply find a home for your gnome so that you can enjoy a lifelong friendship.